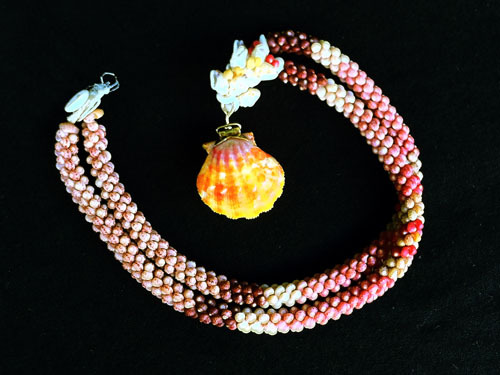 This unique necklace flaunts a Gold Sunrise Locket and shells wound together in a two strand Rope design with mixed momi pakaki shell design. The full Sunrise shell charm has been bound with a 14 karat gold hinge that can open and close (much like the locket pendant's of the Victorian Age) updated with an all natural Sunrise shell for a true “one of a kind” piece. 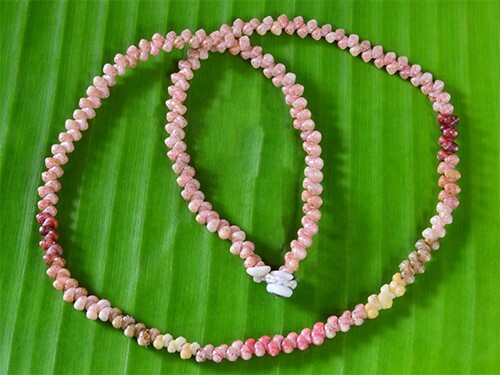 Six colors of Kahelelani shells: common/ tan, burgundy, gold, white, pink and red: 18.5″ in length.